Since the airspeed is still locked I assume there is still a locked settings file, same as before? If I wanted to upgrade my plane to Skyview, and sell my D180, would it have to go back to Dynon to have the locked setting turned off? First of all, Dynon must be convinced that the D-180 has been sold and will be installed in another aircraft, not an RV-12. Then the D-180 can either be sent to Dynon or they can email an unlock file to the new owner. I installed D-180 firmware version 5.5.0 and it works great with no issues or problems that I am aware of. One question, did you have to redo any of the your personal D180 settings or autopilot settings after the update? Example: fuel flow K factor, etc. In the past, these were reset to defaults by an update, but the calibrations like the fuel tank and compass were not. I am in the process of making sure I have everything recorded before doing the update. I should have recorded all of the setting but did not. Some could have changed without me noticing. Well, I didn't adhere to the 'don't fix what ain't broke' credo, and did the 5.5.0 update. Followed the update instructions to a T. After update, all buttons on AP74 were lit up! Did a DSAB check and confirmed that the AP74 and servos were missing! Oops! I needed to do a DSAB configuration. A discussion with Dynon confirmed there seems to be a problem with the update when used with Vans locked file. Things got worst. As Van's warned as a possibility, all user settings seemed to get wiped out! (and I mean ALL! ...even Hobbs & Tach time reset to 0; I did take a lot of pics of a lot of screens - but not enough!!) After another call to Dynon to see if there was any way to input my tank calibration settings I had recorded and saved from my original calibration (there isn't!!!! - must recalibrate! ), I realized the task ahead. Still need to recalibrate compass, AP, etc etc etc. All this just to correct the minor anoyance of the GPS Nav getting dropped now and again. UGH! Knowing what I know now, I NEVER would have updated. I have many hours ahead just getting back to where I was (though I am considering reloading my 5.4.3 settings..) For those that wished Van would 'unlock' our D180, all I can say is watch what you wish for! The 5.4.3 update went without a hitch. This one for me is a disaster! Did you really lose the tank calibration settings for the float? I just performed the update to 5.5 this evening and it appears the float calibration was not reset. The other items you mention have to be reset. Not difficult but a pain. (Another reason for Van's to ditch the notion of the necessity of a locked setting file)! Suggest to those that have yet to install, take photos of all of the screens before installing the update. You just saved me a lot of pain and suffering! Thanks. I can live with the Nav Source lost glitch. Given the horror stories, is Dynon going to put together an update that has fewer consequences? I would like to update because it will solve an annoyance but it sounds like trading an annoyance for a disaster. Is it possible to download all of the settings and restore them after the update if they are lost? It seems to me that Dynon has that capability. My buddy, Skunkworks, builder of one of the best -12's flying, was going to do this update for me this week end. I am with the others, I don't need this hassle, I have been through enough with the D180 over the years. Mine was sent back to Dynon 3 times in 3 weeks for completely berzerkish behavior before they sent me a new one. Over 200 hours now without a hiccup so for now, I will just keep pushing the NAV button. I do think Dynon will remedy this. They are a good outfit. The update is not too difficult but takes a bit of preparation. Here is what I remember from last night. Record the following parameters as they have to be re-entered. (I also took photos of ALL of the D-180 screens, prior to the update as a backup). 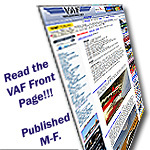 Follow the update instructions (print the pages) as shown on the Dynon website and the RV-12 Dynon D-180/D-100 Upload instructions as shown on the Van's website. Also print the "RV-12 D180 Presets" .pdf file from the Van's website. Prior to the update, BACKUP the D-180 firmware. Prior to the update, BACKUP the D-180 checklists, if you customized them. (I did not have to restore, they were untouched). Set the trim to the Take-Off position. Just in case you lose this parameter. (I did not have to restore, it was untouched). Set the Hobbs time and the Tach time. Check the EFIS/EMS SERIAL settings. If the autopilot is installed, Reconfigure DSAB to re-find the AP74, roll and pitch servos. If the autopilot is installed, enter the Roll Servo and Pitch Servo settings. If the autopilot is installed, review the autopilot alarm settings and set as desired. If the autopilot is installed, toggle the bugs on or off as desired. Set the Fuel Flow K factor. If you customized any of the EMS alarms, reset as desired. The clutter menu is UNLOCKED via this update. Toggle the display items on or off as desired. See pages 5-8 thru 5-10 in the D-180 Pilot's User Guide (Revision H). Run thru the "RV-12 D-180 Presets" .pdf file and check all to see if in agreement. If you find an item that does not agree, review the D-180 Pilots Guide and/or the D-180 Installation manual and choose the setting you desire. I did NOT lose the fuel float calibration. I did NOT lose my customized checklists. I did NOT lose the trim takeoff setting. I do not know if I have to recalibrate the magnetic compass. (Others please comment). I do not know if I have to recalibrate the AOA. (Others please comment). The update to 5.5 was no different than the update from 5.3 to 5.4. Not hard and FAR from a horror story. Last edited by MartySantic : 08-29-2013 at 10:00 AM.